A refreshing lime and basil infused vodka cocktail with a touch of sweetness. Place the lime juice and the basil into a metal cocktail shaker. Using a muddler, mash the basil leaves thoroughly against the bottom of the shaker. Add the simple syrup and vodka and fill with ice cubes to the surface of the liquid. Shake vigorously until the shaker is freezing your hands, perhaps 15 seconds or so. My feeling is you can’t serve a gimlet that’s too cold and besides a good shake is part of the presentation. Show some passion! 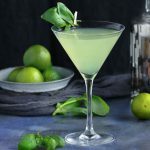 Strain into a martini glass, and garnish with a basil leaf. If you have a tiny clothespin (here’s a link) use that to fasten the basil leaf to the glass. If not, you could hang a lime wheel over the side and use a toothpick to attach the basil leaf to the lime.